Frozen is just plain terrible, your Millennial score, and more. At Seattle’s latitude, fully dark night is currently lasting only two hours. At Bellingham’s, there is no fully dark night right now. That’s what Cliff Mass says. Initially intended as a weekend reading item, my reflection on Rebecca Solnit’s stunning Wanderlust grew into a full-blown blog article. Read it here. Given my daughter’s obsession with the as-yet empty bird nest on our front porch, I was peculiarly interested in this Scientific American piece on whether parents abandon baby chicks that have been touched by humans. Also, this infographic on what the war in Syria would look like if it were waged here. And, finally, in whatever the opposite of slumming would be, Seattle entrepreneur Nick Hanauer’s screed in Politico on why American zillionaires ought to read up on Marie Antoinette. I saw the film “Obvious Child” this week and thoroughly enjoyed it. It disarms with generous doses of humor to intelligently and practically discuss the reality of a young woman choosing to have an abortion. In doing some research on Millennial audiences this week, I came across this 2010 Pew Research report on this rising generation, complete with a (likely already outdated) report, great graphics, and even a quiz. I scored a 72! At Cascadia Weekly, Bob Simmons frames Wyoming’s surfeit of coal as rich in the wrong stuff. At Huffington Post, Bart Milaihovich rips into a sham public hearing on oil train safety orchestrated by the industry and its surrogates. In policy terms, climate action—if it happens at all—will probably look like health reform. That is, it will be an awkward compromise dictated in part by the need to appease special interests, not the clean, simple solution you would have implemented if you could have started from scratch. It will be the subject of intense partisanship, relying overwhelmingly on support from just one party, and will be the subject of constant, hysterical attacks. And it will, if we’re lucky, nonetheless do the job. The question for Mr. Paulson and those of similar views is whether they’re willing to go along with that kind of imperfection. If they are, welcome aboard. If not—that is, if you can’t recognize that American climate policy will involve American politics—then I’d argue you’re not really serious about fixing climate change. And now I rant. It’s been said that there’s no accounting for taste, and that must be right because how else can you explain Frozen? Like every other parent of a 5-year-old, I’ve had to watch (twice, actually) what is now apparently the fifth highest grossing movie of all time. We’re talking about $1.2 billion worth of viewers. Frozen is, in a word, terrible. And I don’t just mean that it’s terrible in the way that most Disney schlock animated movies are. I am about the furthest thing from a movie snob, but I mean it: Frozen is really, really bad. The animation is ugly. The music is horrendous. The characters are idiotic. The comic relief is grating. The plot is mostly asinine. It has pretty much all the grotesque distortions of women and gender roles that have earned Disney well-deserved excoriations. It was so bad that when I first watched it, well before it became a global powerhouse, I tried (and failed) to get my kid to turn it off after the first 10 minutes. And things have gotten so bad now that the New Yorker—the New Yorker, of all places!—is doing back-bends trying to explain what’s good about the movie. I swear, this will be what finally breaks me. If you’ve had the misfortune of watching Frozen too, let me suggest a dose of antivenin: The Snow Queen, the Hans Christian Andersen story that allegedly inspired the movie. (It’s possible, though, that Disney may just slap that sort of claim on the screen to provide a veneer of legitimacy and also to drive me closer to insanity.) I had the pleasure of reading The Snow Queen aloud to my kid recently, and it’s everything the movie is not. Although certain elements like the religiosity haven’t aged well, the Andersen story advances a proto-feminist adventure narrative (the little girl is the main character, and she rescues the little boy) with a vibrant and haunting power that is just totally captivating. Forget shorter showers? You knew that already (but you still take short showers). But here’s a great essay on why we need political change, not just personal change. Amen. And when we do see political change—a shift from “you’re on your own” or even “all-hands-on-deck” to a real take-back of power from corporations and true system-wide accountability for, say, big polluters—I think all us do-gooder short shower takers (and bike commuters and recyclers and energy efficiency bulb users and hybrid drivers and thrift store shoppers and cloth grocery bag users and solar power boosters and local food eaters) would feel an enormous burden lifted off our shoulders. A busy new thoroughfare will connect Seattle University’s campus with Volunteer Park—but not the kind that might immediately spring to mind. This one is for native bees, butterflies, birds, and other pollinators! That’s the hope of Pollinator Pathway founder Sarah Bergmann and Capitol Hill Housing’s EcoDistrict Director Joel Sisolak. They’re working on a 1.5 mile stretch of connected green spaces—or “networked habitats” including parks and private parking strips—for pollinators to get safely and happily around the city doing their good work. A first Pollinator Pathway mostly linking gardens in single-family residential neighborhoods on Columbia Street is already underway with 20 of 60 sites already established. The new Pathway poses a design challenge (and community-building and beautifying opportunities) as it will travel through more varied urban terrain, including small commercial, institutional, mixed use and apartment buildings. 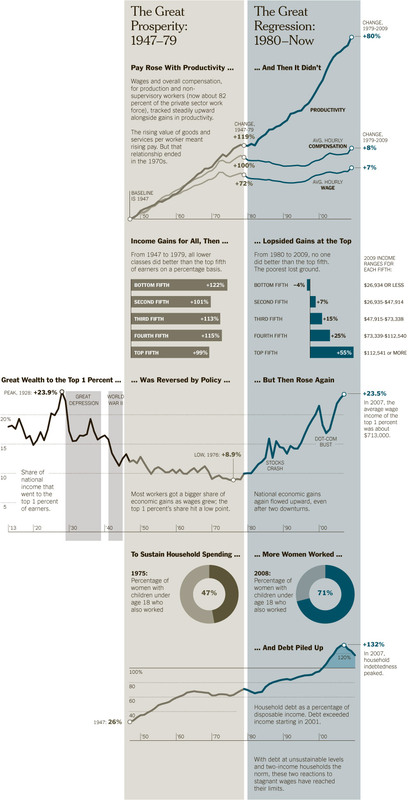 An oldie but a goodie: an infographic on widening income inequality. The bottom line: since about 1979, a growing share of wealth has gone to the super-rich…while many ordinary folks have gone into debt to sustain their lifestyles. My favorite thing from Sightline Daily this week: a map of the hundreds of tribal nations in Canada and the lower 48 states, with the names they used for themselves. Inspiring, but it also makes me feel a bit melancholy. From Rocky Mountain Institute, a discussion of why solar power is so expensive in the US. Hint: it’s not the cost of solar modules themselves, it’s everything else: acquiring customers, financing, labor, and permitting. In the US, actual solar panels make up less than a fifth of the cost of residential solar installations. Chicken. Chicken chicken chicken, chicken chicken chickens chicken. Chicken chicken. Thanks to Donald & Pamela Mitchell for supporting a sustainable Northwest.